New category for more trip requests on GrabCar 6-Seater Economy! NEW CATEGORY WITH HIGHER FARES = MORE EARNINGS! Great news! On 28 April 2016, we introduced a new GrabCar vehicle category called 6-Seater Economy and your account has been automatically registered! All you have to do is follow the instructions in the video below to activate your account on GrabCar 6-Seater Economy to start accepting MORE TRIP REQUESTS and INCREASE YOUR EARNINGS! *The same policies as GrabCar Economy applies for additional stops ($5 per additional stop within 5km; new booking if the detour exceeds 5km), additional waiting time ($5 per 10 minute block), and toll fees (chargeable to passenger if incurred while travelling from pick up to drop off point). CLICK on the video below to find out now! Note: Please ensure that your rear seats are upright and your boot is empty before you activate this new vehicle type. As a 6-Seater Economy partner, not only will you enjoy higher fares and the most competitive commission rates, you also stand to benefit from our weekly Fare Incentives! Will I still see a fixed fare? Will I still receive GrabCar Economy bookings? Yes! You will be assigned both GrabCar Economy and GrabCar 6-Seater Economy bookings as long as enable both of these vehicle types in your Driver App. Watch the video above to learn how to activate them. Will all my passengers be covered under Grab’s Personal Accident Insurance? Yes! As long as you are carrying no more than the legal limit of passengers allowed in your vehicle. Do my GrabCar 6-Seater Economy trips count towards my GrabCar Economy incentives? No. The GrabCar Economy and GrabCar 6-Seater Economy incentive programs are independent of each other. Similarly, trips completed on one vehicle type do not count towards incentives for the other vehicle type. 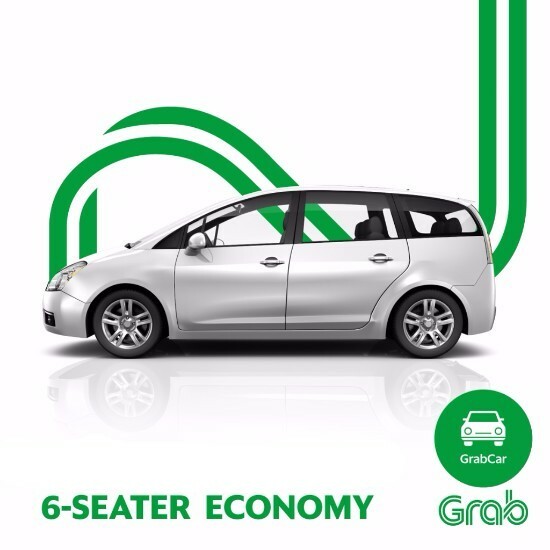 For example, 6-Seater Economy trips do not count towards the GrabCar Economy loyalty incentive. How will I be paid for my GrabCar 6-Seater Economy trips? The exact same payment process and timing will apply as for GrabCar Economy. Your Grab statement will provide details on how much has been paid to you for GrabCar Economy and GrabCar 6-Seater Economy incentives respectively. When can I expect to start receiving GrabCar 6-Seater Economy trip requests? We will be informing passengers about this new service on 28 April, so expect bookings to come in after that! Don’t forget to activate the 6-Seater Economy vehicle type in your driver app!